I am discovering more and more that I am a purist at heart. I am also an incurable experimenter, so I usually try all the wacky and unusual combinations before finally deciding that simpler is better and the original is best unadorned. I often reserve the unusual, but delicious for special occasions or holidays. In terms of cookies you cannot get more basic than sugar cookies. Which is perhaps why they are so difficult to make gluten free. There are not a lot of flavors to hide the fact that you are substituting the foundation: wheat flour. 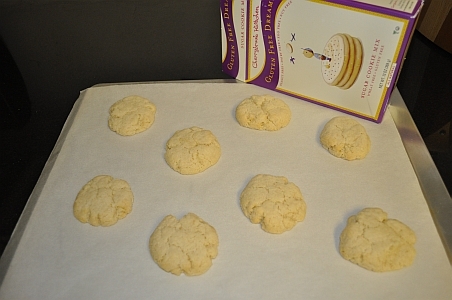 Cherrybrook Farms has made a very good version of sugar cookies in their Cherrybrook Farms Gluten Free Sugar Cookie Mix. Even if you choose to follow the instructions to a “T,” you will end up with a very credible gluten-free, peanut-free, dairy-free, egg-free sugar cookie. The back of the box instructs you to add 1/2 cup melted margarine (or butter), 1/4 cup rice milk (or soy or dairy milk), 2 1/2 teaspoons of vanilla, and the contents of the mix. The final product will look a little different from traditional sugar cookies in that this cookie bakes up more like a mounded tea cookie. I will detail the substitutions and techniques I used to achieve the familiar flattened and sugar-coated treat I like best. I added 1/2 cup ground almonds to the batter to eliminate the slight grittiness that I detected in the final product. If you have nut issues or are worried about the extra fat/calories, feel free to leave it out. I also tried substituting vegetable oil during one of the trials for the margarine/butter with success. 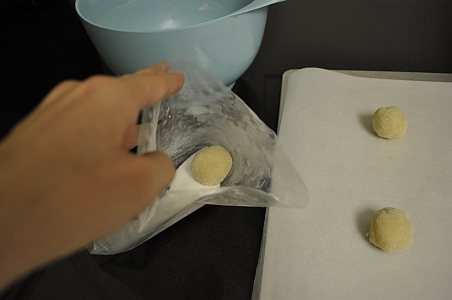 Next, I formed balls with about a tablespoon of dough and rolled them between my hands. I added about a 1/4 cup sugar into the bag the mix came in and tossed my rolled balls in one at a time for a brief coating in sugar. Next I placed about 1 dozen sugar coated balls on my cookie sheet and pressed each with the bottom of a drinking glass. Press these flatter than you normally press cookies, because these cookies do not spread while baking, although they will puff slightly. Enjoy these cookies just as they are or slather with homemade or purchased gluten free frosting or glaze. 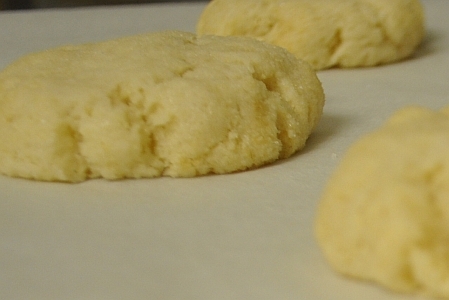 You could also add cinnamon to your sugar coating and turn these into snicker-doodles. They keep well when stored in an airtight container for 3-4 days (if they last that long : ). These cookies pack up well as lunch bag delights.